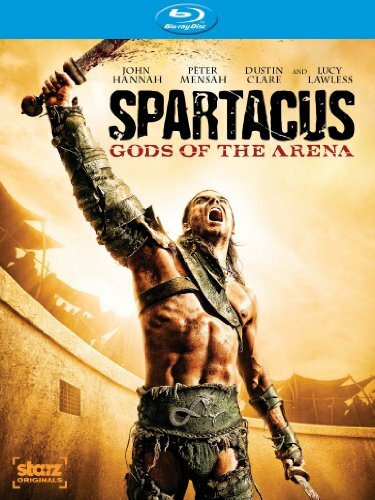 ANCHOR BAY ENTERTAINMENT UNLEASHES Spartacus: Gods of the Arena WITH ITS FIRST-EVER 3D BONUS FEATURE! Two-Disc Set Contains All Six Episodes and An Amazing Array Of Bonus Features! Beverly Hills, CA – Spartacus: Gods of the Arena the exciting STARZ Original series, is ready for battle when Anchor Bay Entertainment releases the prequel to the acclaimed "Spartacus: Blood And Sand" on Blu-ray and DVD September 13, 2011. The two-disc collection contains a muscular amount of bonus features including never-before-seen featurettes, bloopers and behind-the-scenes footage (including a set tour with star Lucy Lawless). The Blu-ray is even mightier with extended episodes, audio commentary on all six episodes and a mind-blowing battle sequence in 3D - a first for a TV on Blu-Ray release! A sneak peek of the 3D bonus feature will happen at the STARZ booth at Comic-Con 2011 in San Diego. Spartacus: Gods of the Arena premiered January 21, 2011 on STARZ and delivered record ratings for the network. With each new episode, the series continued to gain devoted viewers. Executive produced by Rob Tapert, Sam Raimi, Joshua Donen and Steven S. DeKnight, this exhilarating season follows Gannicus, the charismatic gladiator aspiring to become Champion of Capua and of the House of Batiatus. With political ambitions and poised to overthrow his father and take control of the House, a young Batiatus will freely betray anyone to ensure his gladiators are in the highest demand. With his loyal and calculating wife Lucretia by his side, they will stop at nothing to deceive the masses. Joining returning stars, John Hannah (The Mummy, Four Weddings and A Funeral) as Batiatus, Peter Mensah (300, The Incredible Hulk) as Oenomaus and Lucy Lawless ("Xena: Warrior Princess") as Lucretia, are new cast members Dustin Clare ("Underbelly") as Gannicus, Jaime Murray ("Hu$tle") as Gaia and Marisa Ramirez ("General Hospital") as Melitta.